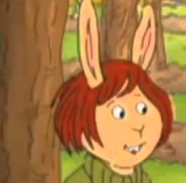 What if Prunella Deegan got ran over by a car? What if Prunella Deegan got ran over by a car, while trying to find a non-Braille copy of Henry Skreever and the Cabbage of Mayhem in any store in the episode, "Prunella's Special Edition"? Re: What if Prunella Deegan got ran over by a car? There would be yet another episode about a character being affected by some sort of ailment. whom afterwards we would never hear of or see ever again. Instead of your assumed intentions to abolish a decidedly-annoying character*, it would turn into another "Very Special" episode revolving around the hospital system. * I always thought she was funny, albeit ungrateful every now and again - oh well. I'm sure I've missed a few in this list, and there are a few that almost count, such as So Long, Spanky and Arthur's eyes, but I didn't count them here.